11th February 2010 marked the centenary of Tom Rolt's birth (see a full chronology of LTC Rolt's life and works). Between June and August, Narrow boat 'Heron' completed the same route covered by 'Cressy' in 1939. Find out more. A special train ran with invited guests in May. The event was followed by the 'Tom Rolt Rally'. Richard Rolt led a parade with the 12/50 Alvis four seater, originally purchased new by Tom's father in 1926 and maintained on the road ever since. In June, Chester IWA hosted a banquet and a centenary rally bringing together canal boats, vintage cars and the Tom Rolt locomotive from the Talyllyn Railway. A plaque was unveiled on the house where Tom was born. Find out more. Tooley's Boat Yard & Banbury Museum. In August a plaque was unveiled commemorating the yard where 'Cressy' was refitted, and from where Tom and Angela set out on their 1939 voyage. The August Prescott VSCC (Vintage Sports Car Club) meeting hosted a ceremony to name one of the corners on the course after Tom. Find out more. The August 2010 rally at Beale Park was held in honour of Tom Rolt. Narrow boat 'Heron' completed the home leg of her journey retracing Tom's historic 'Cressy' journey - see the map of this route. The Association of Industrial Archeology annual conference took place this year at Falmouth. Instead of the annual Rolt Lecture, one morning of the conference was set aside for a symposium, consisting of personal reminiscences and testimonies from some of those who knew Tom. The proceedings are recorded in the IAR. See Press and media. The Newcomen Society hosted a dinner at the National Canal museum in honour of Tom. Speeches were made by Timothy West, Richard Rolt and the President, Dr John Russell. This year's Cheltenham Literary Festival included an event which featured Timothy West, well-known actor and canal boat owner, and Tim Coghlan, Rolt enthusiast and owner of Braunston Canal Centre. This event was sponsored by the Friends of Cheltenham Festival of Literature. The talk was repeated at the Bath Literary Festival in 2011. Oxfordshire IWA Members Gillian and Peter Bolt delivered a talk on Tom’s Irish canal journey and the legacy of his book, Green & Silver , for the Irish canal movement. Tom's widow Sonia was made an OBE in the 2011 New Years Honours. 91-year old Sonia was honoured for her services to industrial archeology and to heritage. The year also saw many new items published about Tom. Find out more. 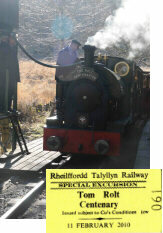 On 8th November 2010, BBC Radio 4 broadcast a programme celebrating the life and legacy of Tom Rolt. This programme was presented by Hermione Cockburn and edited and produced by Julian May. Find out more. 2010 was a busy year for reprints of LTC Rolt titles, with ten new reprints including two titles that have been long out of print. For details of these and other reprints see Re-issues. "All of us are united in our admiration of the work of Tom Rolt, whose achievements we salute in this centenary tribute."